Background Context - When did these events take place and how long was Job sick for? Exactly date and time no one knows but there is a range based on the Bible logic. Job lived just after Isaac and the Patriarchs, during the time Israel was in Egypt. Rationale - 1) Eliphaz (Job 2:11) one of the eldest of Job’s friends was the son of Esau (Gen. 36:10-11) and he was a Temanite, Teman was the city of Edom (Ezek 25:30), Edom were the descendants of Esau (Gen. 25:13). Jacob was Esau's brother. Job died at the age of ~190years according to children, i.e. first set of children who were adults then died, then add on 140 years (Job 42:16) or ~240 years (according to the Septuagint). He lived longer than Abraham and Abraham’s grandfathers like Nahor (Gen. 11:18). Job was probably sick less than 6months (~0.3% of his life). Job was probably sick for more than a month as people began to worry that he isn’t getting better, after 2months probably going to tell/prepare people (60days+). WHEN Job's friends heard about Job's suffering (what happened to his family, farm and now his sickness), they came to mourn and comfort him (Job 2:11). They didn’t wait around but came when they heard (Job 2:11). Uz, where Job lived, is believed to be north east of the Sea of Galilee (Job 1:1), some believe 200km south east of Jerusalem. His friend’s locations varied, Eliphaz the Temanite (from Teman in land of Edom Ob. 1:9, 280km south of Uz), Zophar the Naamathite (from Naamah, which is ~170km south west), Bildad the Shuhite (from region on the western side of Chaldea, bordering on Arabia, both sides of the Euphrates - ~700km east of Uz) (Job 2:11), and there is no information on Elihu so he was probably a local. This was the nationality of his 3 friends, not necessarily where they lived. It was more likely that they were in close proximity to Job because they were together with him at the same time – they were probably less than ~150km from Job (~15day journey). It is more likely they were closer than that. Thus sum of the days of his sickness is probably 100days (3-4months) = 60+15 x 2 (incl. Time taken to receive the news) + 7 (mourned with him) + 1 day dialogue + 1 day sacrifice animals then he was healed. What is "suffering" a result of? Why did Job suffer? We know God said that Job was a blameless and upright man and there was none like him on the earth. Job was blameless and upright just like God said. He could have sinned but it wasn't because of his sin that this came on him. God wanted to brag to Satan about Job and He can do whatever He wants to do because He is Sovereign. It wasn't about anything Job did it is because God wanted to brag. “There was none on the earth”, was just to highlight that he was unique. Upright doesn’t mean sinless but he was upright in motivation, that is, he feared God and shunned evil (Job. 1:1). Blameless doesn’t mean sinless but means no outward cause - his sins were covered. “According to the law almost all things are purified with blood, and without shedding of blood there is no remission” (Heb. 9:22). His blood sacrifices covered his sins, and also did it on behalf of his children (Job 1:5). But it didn’t take it away – only covered it, thus blameless – without cause (Heb 10:4). What happens if he sinned unknowingly and didn’t sacrifice an animal – could that have been an avenue through which Satan came in? All suffering is a result of sin, i.e. if Adam didn’t fall then suffering wouldn’t have existed (Rom. 5:12-14). Just "like a flitting sparrow, like a flying swallow, so a curse without cause shall NOT alight" (Prov. 26:2). All have sinned or are born into sin, even a new baby (sin is in our blood). Sometimes the result isn’t due to the person but someone or something else that sins. All have sinned and fallen short before the Glory of God (Rom. 3:23). So Job obviously had some sin. Job 1:22 “In all this Job did not sin nor charge God with wrong.” And Job 2:10 “In all this Job did not sin with his lips.” During that specific situation Job did not sin physically or with his mouth nor charge God wrongly – it isn’t saying that he didn’t sin before or after this. Why was God bragging? Who initiated it? Because He can, he wanted to prove to Satan that Job was God focused. God initiated it twice (Job 1:8; 2:3). God had Satan do something without Satan knowing the intent. Satan was motivated to prove God wrong but God motive was to help Job. God did this because He was merciful and compassionate on Job (James 5:11). God knew Satan was governed by pride and Satan would have swallowed it hook line and sinker. Satan unknowingly did it. If he knew the eternal outcome where Job was heading, he wouldn’t. God knew this and wanted to save Job. Why would God want Satan to attack Job and not correct him Himself? Because God wouldn’t bring that kind of destruction on His people (Rom. 1:18; Mat. 26:39; Gen. 19; Gen. 6-9; Luke 17:26-37), and any chastisement God gave Job, Job would have just accepted it but NOT sought God on it and therefore not learnt from it (just like many Christians today). God was very compassionate on Job, and wanted to help Job see the error of his way and live in victory. “You have heard of the perseverance of Job and seen the end intended by the Lord—that the Lord is very compassionate and merciful” (James 5:11). The end was more beneficial than the short process he went through, but the process helped him see the error and live in victory (Job 42:10-16). God is merciful, He needed Job to see the sin and repent. But wouldn’t have sought the Lord unless it was drastic situation. He lived a life of acceptance of situations and wasn’t learning (like the sovereignty doctrine that many believe today). Keep in mind that Job didn't have any word of God to help him navigate (Job 31:35) nor did he have Holy Spirit in his heart to navigate/teach him as the Church has today. He had to learn from cause and effect and through what was told him from generations before. So Job was in a far tougher situation than any Christian. Look at a similar situation with the Apostle Paul, who handed a Christian man over to Satan (1 Cor. 5:1-5). Was Paul unrighteous for doing this? No, He had the mind of Christ. Why did he? This Christian man’s continual sin drove him away from God, he wasn’t listening to the council or the word of God, thus couldn’t listen to the chastising of the Lord. The Final step is handing him over to Satan. Paul loved him and didn’t want to see him go to hell, but “that his spirit may be saved in the day of the Lord Jesus” (1 Cor. 5:5). Maybe the consequences will bring him to repentance. And the protection within the Church was preventing him from the consequences of his sin. Who actually brought this on Job? Why did God allow Job’s children to be killed? Why would a loving God allow such tragedy to happen? Because there is a bigger picture that we don't know and maybe we will never know. We are to just trust God because He allowed it for a reason for good that we may not understand now on earth. “So it was, when the days of feasting had run their course, that Job would send and sanctify them, and he would rise early in the morning and offer burnt offerings according to the number of them all. For Job said, "It may be that my sons have sinned and cursed God in their hearts." Thus Job did regularly” (Job 1:5). Firstly, his children didn’t suffer and suffer, they died! It was Job who suffered their loss. Secondly, his children were adults, they were no longer under Job’s authority and had their own houses. Job’s intercession was probably preventing them from getting the consequences of their actions, as an Individuals is responsible for their own sin (Ezek. 14:12-23). His children weren’t in a relationship with God because of their behaviour, or else why would Job sacrifice animals for them regularly thinking that they may have cursed God in their hearts (Job 1:5). He obviously knew what they were like. And if they had a relationship with God why didn’t they do their own sacrifices? They weren’t righteous because every righteous person before and during the OT sacrificed animals. The situation is most likely similar to the prophet Eli's sons and we know what happened to them even though Eli prayed for them. Job’s children weren’t under his authority and probably sinning thus causing Job to diligently sacrifice on their behalf. Don’t measure the level of the destruction to the level of the sin – we are all sinners, some of us are redeemed sinners. How did Satan have access to Job? What was Job’s sin? God said to Satan that he attacked Job without cause (Job 2:3). God just allowed it because He is Sovereign. Job’s sin didn’t cause this to come upon him. Yes, Satan didn’t have a cause to attack Job (no words or actions from Job to warrant it). But there was a cause for God to allow access from Satan – sin in Job that did impact his words and actions. His sacrifices probably covered them and blocked the access of the enemy, therefore no cause. Satan couldn’t see into Job’s heart, nor does he have access. If he could then he would have interpreted both Pharaoh (Gen. 41) and King Nebuchadnezzar's (Dan. 2:29) dreams through false prophets. Also nowhere in the Bible does it say Angels can read the hearts/minds of people, but it does say God can (Ps. 94:11; Matt. 9:4; Rev. 2:23, 1 John 3:20). A side note - The only way Satan can read our mind is by listening to our words and watching our actions. “You are snared by the words of your mouth; you are taken by the words of your mouth” (Prov. 6:2). Satan is known as the accuser of the brethren (Rev. 12:10) – he uses our words and actions. Our words release our authority. To show the power of our words, why do you think confession is made to salvation, repentance spoken out loud to God, Prayer is spoken out loud to God, casting out demons with a word, God spoke those things that be not as if they are etc. Our words and actions release our authority from our heart and that is why Jesus said – that which comes OUT of the heart that defiles the man (Matt. 15:18). The mouth is a release gate for what is in the heart. That is why Paul said in Col. 3:17, "Whatever you do in word or deed do all to the name of Jesus Christ." God does tell Job through Elihu that there was a cause – God “repays man according to his work” (Job 34:11) then tells Job’s friends that Job “adds rebellion to his sin” (Job 34:37). Job’s sin was self-righteousness – Pride (Job. 34:37, context 10-12; 33-37; Job 40:4; 42:5-6), the result of self-righteousness is fearing consequences (Job 3:25). It wasn’t as if this situation caused Job to be self-righteous, he had it before and only the situation of his sicknesses revealed it. The result of self-righteousness is fear of consequences. Adam ate of the forbidden fruit because he wanted to be like God (self righteous), just after this happened he hid himself because he was afraid (Gen. 3). Self-righteousness accuses you of not doing everything right, Job knew this feeling of fear very well. God and Elihu (God’s spokesman) showed him what his sin was – Job was trying to maintain his righteousness through works, this is called “self-righteousness” and it evokes pride against God (Job 35:2). Blessed is that man who makes the Lord his trust...Sacrifice and offering You did not desire; My ears You have opened. Burnt offering and sin offering You did not require (Ps. 40:4,6). O Lord, open my lips, And my mouth shall show forth Your praise. For You do not desire sacrifice, or else I would give it; You do not delight in burnt offering. The sacrifices of God are a broken spirit, A broken and a contrite heart-- These, O God, You will not despise.... Then You shall be pleased with the sacrifices of righteousness, with burnt offering and whole burnt offering; THEN they shall offer bulls on Your altar. (Psa 51:15). Notice first is trust Him, praise Him and then He is pleased with the sacrifices. Now in Christ no need to sacrifice but still need to trust Him, praise Him, broken of self. To fear anyone or anything besides God is sin. God said, “He that overcometh shall inherit all things; and I will be his God, and he shall be My son. But the fearful, and unbelieving, and the abominable, and murderers, and whoremongers, and sorcerers, and idolaters, and all liars, shall have their part in the lake which burneth with fire and brimstone: which is the second death” (Rev. 21:7-8 KJV). Why? Because all fear is a result of unbelief in the promises of God (Heb. 3:16-19). For “the fear of man brings a snare, but whoever trusts in the LORD shall be safe” (Prov. 29:25). Fear is faith in the negative. Therefore what Job greatly feared came upon him (Job 3:25). Please note - what Job "greatly" feared came upon him (Job 3:25). It didn’t say that he just feared, but that he GREATLY feared. He feared the consequences more than God Himself, for no-where in Job does it say that Job greatly feared God. It only says he feared God (Job 9:35). He feared the consequences at a higher level than the relationship with God thus did things to avoid the consequences like the multiple sacrifices. For perspective, the term ‘greatly fear’ is used in 2 other places in the Old Testament (Hebrew word sequence) – it is in reference to greatly fearing God (Ps. 14:5) and the other is against God fearing the unknown (Ps. 53:5). Why is God greatly to be feared? Because what you fear the most you respect the most and your actions/motivations are based on that fear. Therefore “God is greatly to be feared in the assembly of the saints, and to be held in reverence by all those around Him.” (Ps. 89:7). That's why the devil walks around roaring, not biting, to make us scared in order for us to fear the situation (1 Peter 5:8) and by fearing the situation above God we step outside his protection, i.e. we break the faith link like Peter scared of situation of the waves and wind more than His trust on Jesus and thus he started to sink (Matt. 14:29-31). What was the benefit of the suffering? For us to understand that there is a bigger picture that we don’t understand. That we can relate to Job and his suffering, to accept it as part of God’s plan even when we don’t know what it is. Don’t complain about the suffering but look for the opportunity to leverage this for God to shine through. It revealed what was in Job’s heart. Like cooking a lean chicken and not seeing the fat. After sometime the fat rises and it is revealed on the surface. For true repentance to take place, it needs to come from and out of the heart. What did Job believe about his situation? What was Job's quest during the fast? He believed he was blameless and it was an unjust act of God. He wanted God to show him the reason. God was doing it to him (Job 1:21), He can do what He wants to (give or take away). But when he became sick he believed he was righteous and did nothing to deserve this (Job 13:3). This resulted in his anger and injustice towards God. After the first few chapters Job opens his mouth to curse himself, against his birth thus against creation and the council of God (self-righteousness). Then Job justifies himself by saying that this was an unrighteous act by God, he was sinless and he wanted God to show him why (Job 7:20-21; 10:2-3; 13:3 etc.). Did God show him the reason? God didn't show him the reason except that Job needed to accept it as there are things bigger than he knows. Job didn’t make the clouds etc. The lesson here was that Job not be concerned about “why” this happened but rather accept that God is in control. God would take care of him and thus gave him double because He wanted to. Yes after Job sought Him with fasting and prayer. God helped him understand the reason for his suffering and he also acknowledged it by repenting (Job 42:4-6). 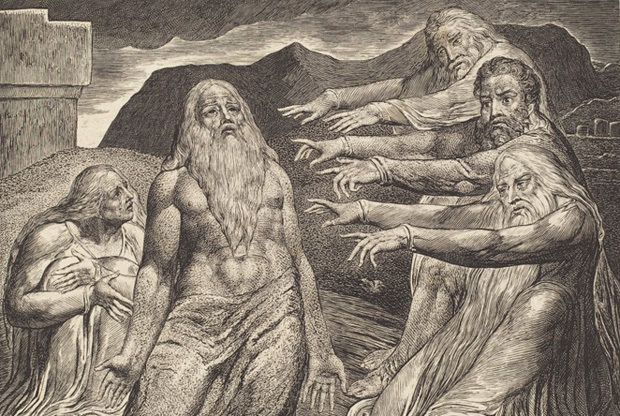 What did Job's 3 friends believe was the cause for Job's sickness? Why was God angry with his 3 friends? They believed that he must have sinned against God because God is not unjust. They weren't right at all, they weren’t compassionate and they condemned Job for no reason. It wasn't sin but God’s plan. They didn’t know what the sin was exactly but they knew it was sin and condemned Job without providing the proof of the sin. They placed their thoughts of what sin Job had and instead of helping him they fuelled the fire. What they said about sin in general was true but they were wrong in their accusations against Job, and wrong about how God operated through Job’s sins. They ascribed different types of sin without proof and without hesitation (their own pride), e.g. "Then Eliphaz the Temanite answered and said: "Is it because of your fear of Him that He corrects you, and enters into judgment with you? Is not your wickedness great, and your iniquity without end? For you have taken pledges from your brother for no reason, and stripped the naked of their clothing. You have not given the weary water to drink, and you have withheld bread from the hungry. But the mighty man possessed the land, and the honorable man dwelt in it. You have sent widows away empty, And the strength of the fatherless was crushed" (Job 22:1-9). Side note: Please remember his friends still empathised with him or else they wouldn't have come to mourn with him, nor fast 7 days with him without saying a word. How many people today have friends like Job’s who would stop work and fast for 7 days with you in ashes? Why didn't God curse Elihu? Not important to know why. Elihu was correct. Elihu’s wrath was kindled against Job’s 3 friends because they had found no answer and had condemned Job without the answer (Job 32:3). Then later God says the same things Elihu had said concerning Job’s friends and Job. Elihu had known Job’s sin before Job's friends started speaking but he allowed them to speak because they were older (Job 32:6). Elihu was God’s spokesman/prophet, which God confirmed by speaking the same words Elihu had said (Job 38:3; 40:7), Elihu said, “The Spirit of God made me, and the breath of the Almighty gives me life. If you can, answer me; set yourself in order before me, stand up (Job 33:4-5)… You said, I am pure, without transgression; I am innocent, and no iniquity is in me; behold, He finds reasons to be against me, He counts me for His enemy; He puts my feet in the stocks; He marks all my paths. Behold, in this you are not right; I will answer you, for God is greater than man” (Job 33:9-13)…. “Job speaks without knowledge (e.g. God gives and takes away not without cause is not true), His words are without wisdom.' Oh, that Job were tried to the utmost, because his answers are like those of wicked men! For he adds rebellion to his sin; he claps his hands among us, and multiplies his words against God" (Job 34:35-37). Job 35:14-16 is another. Why else would Elihu say he adds rebellion to sin, as if his dialogue is causing rebellion but the original sin that caused it was still there? Side note: Elihu talks about the Mediator, God's plan, Jesus Christ (Job 33:23-28), all mighty men of God do this - point to the King of Kings just like Moses (Deut 18:15, 18-19) and spoke correctly concerning the character of God. "For he has said, 'It profits a man nothing that he should delight in God.' "Therefore listen to me, you men of understanding: Far be it from God to do wickedness, and from the Almighty to commit iniquity. For He repays man according to his work, And makes man to find a reward according to his way. Surely God will never do wickedly, Nor will the Almighty pervert justice. Who gave Him charge over the earth? Or who appointed Him over the whole world?" (Job 34:9-13). Yet many believe the opposite to be true. What did Elihu say was the cause for Job's suffering? Elihu said Job’s heart revealed his self righteousness. The words of Job showed what was in his heart. Instead of Job saying, Lord help me, show me my sin, forgive me, what is it so I can repent of it. He was basically saying prove to me God, I am righteous and this suffering is unjust. See the contrast of the first one in humility and the second in pride. Elihu said, “Look, in this you are not righteous. I will answer you, for God is greater than man. Why do you contend with Him? (Answering the why question reveals the sin, his motivation of pride, self-righteous). For He does not give an account of any of His words. For God may speak in one way, or in another, yet man does not perceive it. In a dream, in a vision of the night, When deep sleep falls upon men, While slumbering on their beds, then He opens the ears of men, and seals their instruction.” Why? “In order to turn man from his deed, and conceal pride from man” (Job 33:12-17). God covers Pride so that we don’t fall into that Pit (Job 33:18). "For Job has said, 'I am righteous, but God has taken away my justice; Should I lie concerning my right? My wound is incurable, though I am without transgression" (Job 34:5-6). God was merciful and full of compassion on Job (James 5:11). For by his speech he was adding rebellion to his sin (Job 34:37). Then Elihu continues to say, "How much less when you say you do not see Him! Judgment is before Him; you are waiting for Him. And now, because His anger has not visited, and He does not recognize stupidity, even Job opens his mouth in vanity; he multiplies words without knowledge” (Job 35:14-16). Elihu then ends off (after 5 chapters) by saying that God does not respect any who are wise at heart (Job 37:24). Why did his say that? BECAUSE Job was wise of heart. Paul reminded the early church, “Be of the same mind toward one another. Do not set your mind on high things, but associate with the humble. Do not be wise in your own opinion (Rom 12:16). Therefore let him who thinks he stands take heed lest he fall (1 Cor. 10:12). For 5 chapters (Job 32-37) Elihu focused on Job’s self righteousness/pride and Job’s rebellion towards God through his many words. And guess what – God said the very same thing next. Side note: God repeats many things Elihu said, because He gave it to Elihu and thus confirming what Elihu had said was true. He approaches Job, “Who is this that darkens counsel by words without knowledge? Now gird up your loins like a man; for I will ask of you, and you teach Me” (Job 38:2-3). God wanted to help Job to understand that Job doesn't understand everything (Job 38-39) and his words of rebellion are unjustified. Just like Elihu did. What did God say Job's sin was? And why did Job repent? The result of the sickness wasn’t a result of sin. He repented for speaking and not knowing the council of God, the big picture. And even though Job would never understand why, he needed to accept it. Self righteousness - Both God (Job 40:8, 11-14) and Elihu (Job 33:17; 34:5-6) said it. God questions Job, “Do you condemn me that you may be justified? (Job 40:8) the evidence of his self-righteousness is revealed by his words. God brings up Pride and Job's situation of suffering in one sentence; “Can you bring the proud low? If so, then your right hand can save you” (Job 40:11-14). God provides the key to Job, if he can bring the proud low then his right hand can save himself, but he couldn’t and thus the reason for his suffering. He is unable to save himself of this destruction/ suffering because he is unable to bring his proud low. This is what caused his suffering in the first place, his pride and it was his pride that was keeping him suffering. God first deals with Job’s rebellion (Job 38-39), then God deals with his sin (Job 40-41). God spends the majority time talking about Pride and its destruction (Job 40:11-12). And then talks about the king of pride (Satan) who is the king over the children of pride (Job 41:34). Similar passages - Is. 14:9-15; 1 Tim. 6:3, Rev. 12:3-4. Why did God spend so much time talking about Pride and then one whole Chapter (Job 41) dedicated to talking about the King of Pride (Satan, the Leviathan) and mustn’t play with him? If you had asked God and God spend a few Chapters taking about pride and challenging you concerning pride, would you get the picture? And because SATAN is the king of Pride - he did have legal authority to impact Job. Satan didn’t know this but God was merciful and compassionate on Job (James 5:11). Jesus said that what is in the heart comes out of the mouth (Luke 6:45). Previously, this was in his heart but Job didn't know. Job repented twice, once for his rebellion of his words, "Behold, I am vile; What shall I answer You? I lay my hand over my mouth. Once I have spoken, but I will not answer; Yes, twice, but I will proceed no further" (Job 40:4-5). Then repented after he knew why this happened to him, “I know that You can do everything, and that no purpose of Yours can be withheld from You. You asked, 'Who is this who hides counsel without knowledge?' Therefore I have uttered what I did not understand, things too wonderful for me (things that were for Job’s benefit, too wonderful for him, protecting Job, leading him away from the path of destruction – Job saw the path he was on), which I did not know (notice the past tense, because NOW HE KNOWS, God revealed it to him, he wouldn’t have known if he didn’t seek the Lord through fasting and prayer. And would have continued in the destructive state). ….Therefore I abhor myself, and repent in dust and ashes" (Job 42:2-6). Job repents. Who healed Job? Why was Job healed instantly after he repented and prayed for his friends? God healed him. It wasn't the repentance or praying for someone else. God already proved to Satan that Job didn't curse Him so it was over. And no one knows why he was healed it doesn't necessary mean because he repented and prayed he was healed. God healed him. He was healed because he repented, prayed for his friends and did a blood sacrifice (Job 42:10). After Job repented (changed his heart) – no longer relied on his own righteousness but in God’s, God said that Job had spoken right and now it was his friends turn to repent (Job 40:7-8). For Job – repentance exposed his sins from his heart and the blood sacrifice covered them from God (OT - Ps. 32:1, NT – sins are totally removed Heb. 9), then he showed mercy to his friends by praying for them, he was restored. God said to Job’s 3 friends, “Now therefore, take for yourselves seven bulls and seven rams, go to My servant Job, and offer up for yourselves a burnt offering; and My servant Job shall pray for you (like James 5:16). For I will accept him, lest I deal with you according to your folly; because you have not spoken of Me what is right, as My servant Job." So Eliphaz the Temanite and Bildad the Shuhite and Zophar the Naamathite went and did as the LORD commanded them; for the LORD had accepted Job. And the LORD restored Job's losses when he prayed for his friends” (Job 42:8-10). If Job had repented earlier, would he have been healed? We can't discuss hypothetically. It wasn't the repentance that brought the healing but God proving to Satan that Job wouldn’t curse God with his mouth. The duration of Job’s suffering wasn’t in God’s hands but in his hands. If he knew what his sin was after the first destruction or sought the Lord after the first destruction, then he would have repented and been healed. So if God didn't show up would Job have repented? Probably not, because Job thought he was right (Job 32:1). To credit Job, he was patient with his friends (James 5:11), he didn’t have God’s word like we have today written down or else he would have searched it out (Job 31:35), also he didn’t have a mediator Jesus Christ to pray on his behalf, nor did he have Holy Spirit. But he still understood some fundamentals – that suffering was not good. Also he didn’t accept his sickness. If he had accepted his suffering he would have remained sick. But he sought the Lord through fasting and prayer. If God was bragging to Satan where was he at the end of the book? Not everything is written down in the book of Job. This is further evidence that the intent of the Lord wasn’t to brag to Satan but to help Job. God used Satan’s pride to expose Job’s pride through destruction of pride/ self-righteousness. So that the pride in Job’s heart could come to the surface and God could heal him and set him straight for eternity. What is the patience of Job referring to (James 5:11)? Job was patient with God in accepting it. James taking about Christians, who need to be patient in waiting for the Lord, just like a farmer waits for the fruit. Then says “take the prophets, who spoke in the name of the Lord, as an example of suffering and patience” (James 5:10). They suffered at the hands of people because they were waiting for God. Job stripped of all his worldly possessions, deprived of all his children, tortured in body with sore disease, tempted by the devil, harassed by his wife, and calumniated by his friends yet didn’t curse God with his mouth. But at the end sought the Lord for the reason, didn’t run away from Him. When destruction comes by natural elements like Job, don’t run from God but to Him. Also this message of Job doesn’t promote sitting back and accepting it but doing something about it. Either seek council from God like Job, but with a humble heart (not with “oh why me I am so righteous”). Or as a Christian under a way better covenant than Job, who has Holy Spirit inside them, who has the Bible, who has way better promises, who has a higher authority – Children of God, work at changing the situations, be more than a conquer because of what He has already done. We are in a battle against the Spiritual world of darkness (Satan its head), we are not fighting against God. He wants us to walk as His Children on the earth, have intimacy with Him all the time and to expand His Kingdom.